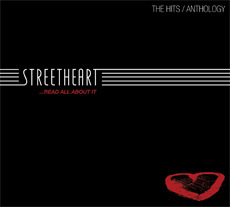 The definitive Streetheart retrospective, …Read All About It contains all the very best of Streetheart in one set. Put together by the band with the co-operation of both Universal Music Canada and Warner Music Canada, RAAI is the most complete recorded history of Streetheart available in one package. Featuring 30 tracks on 2 discs plus a hidden bonus track, …Read All About It also contains a 16 page booklet of personal photos, back stories about the songs from the band and much more. As the material spans the entire studio career of Streetheart, RAAI is a must have for any Streetheart fan looking to capture the whole story in one great package.